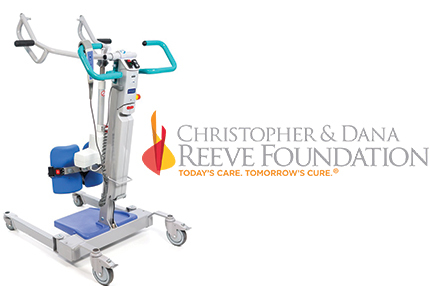 Thank you to the Christopher & Dana Reeve Foundation for a $4000 Quality of Life Grant for the purchase of a Sara Active Lift. The Sara® 3000 is a standing and raising aid that features the latest ArjoHuntleigh-pioneered developments. The ergonomic design and powered features enable a single caregiver to provide first-class care during routine handling activities. Using the Sara 3000 activates mobility during everyday transfers and makes it easier to carry out mobility maintenance and standing exercises. Assisted transfers can be carried out without the stress and risk of injury associated with manual handling. Operation by a single caregiver means maximum efficiency for otherwise labor intensive routines. The excellent level of functionality brings a higher standard of care within reach.